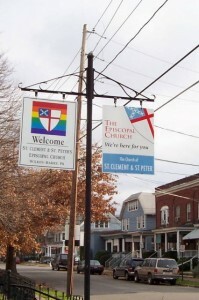 “We, the members of the Episcopal Church of St. Clement and St. Peter, so believe that all people are made in the image and likeness of God, have a special personal relationship with God and are worthy of respect and honor. The Bible, Book of Common Prayer, and the Creeds as embraced by the Episcopal Church are fundamental to our practice of the faith and growth as Christians. We reaffirm our belief in one God who made heaven and earth, all that is seen and unseen, and in one Lord, Jesus Christ, true God and true man. It was for our sake that he suffered death and was raised from the dead and will return again in glory. We believe in the Holy Spirit, the giver of everlasting life.